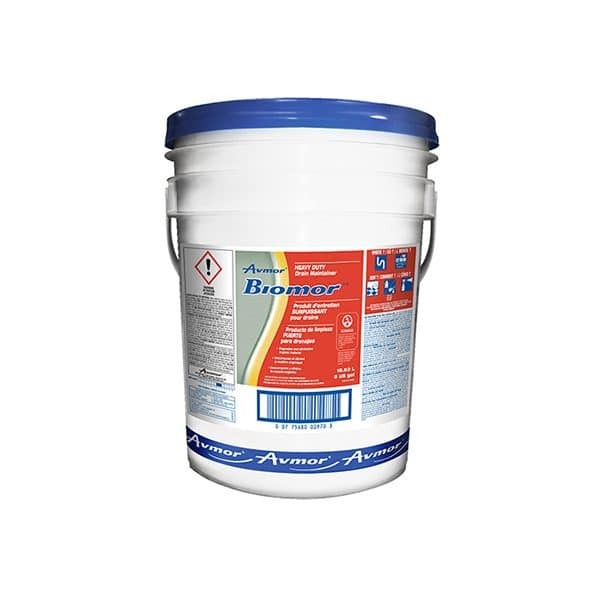 BIOMOR HEAVY DUTY DRAIN MAINTAINER is the next generation for drain and grease trap applications. This microbial based formulation contains a proprietary blend containing bacterial spores designed specifically to digest grease, oils, fats and control odours. BIOMOR HEAVY DUTY DRAIN MAINTAINER works in aerobic and anaerobic environments. It degrades and eliminates grease and other organic materials that accumulate over time. It provides long-term proactive deep cleaning which effectively removes grease build-up in drain lines, grease traps, lift stations, wet wells, sewers, lagoons, septic tanks, wastewater sumps and sewage injection pits. Ideal for restaurants, food processing plants, hotels, high rise apartment buildings and institutional facilities that operate drain lines and discharge lines leading to a central grease trap. SHAKE WELL BEFORE USE. Do not mix the product with sanitizing agents. 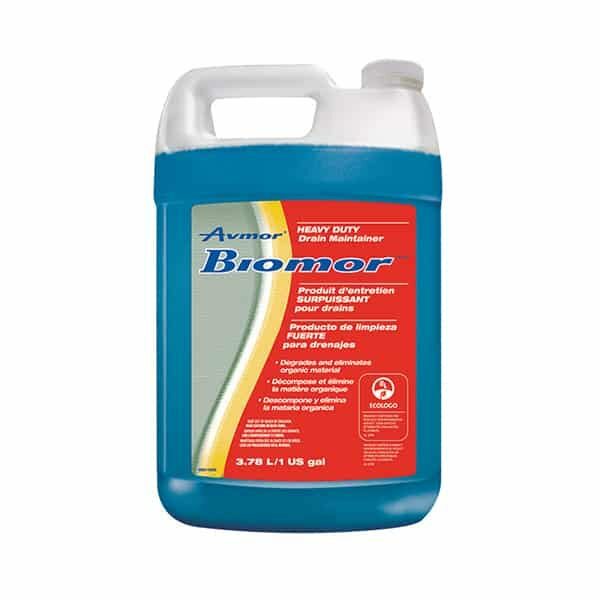 For convenience, BIOMOR HEAVY DUTY DRAIN MAINTAINER may be applied manually or automatically using a metering pump. NOTE: Clean drain lines or grease traps before starting treatment and be sure the pH is between 5 and 8. REGULAR MAINTENANCE: Apply daily 0.8-1.5 ml/l of wastewater to be treated (1-2 oz per 10 US gal). This will depend on the drain lines flow rates or grease volume. Apply daily directly into the head of the drain line system or directly into the grease trap. HEAVY DUTY MAINTENANCE: Increase the daily amount between 2.5-3 ml for each litre of wastewater to be treated (3-4 oz per 10 US gal). Dilute 24 ml of product per litre of water (3 oz/US gal) and pump or pressure spray the solution in order to wet thoroughly the garbage bin and surrounding area. Add 1 litre (32 oz) per month per 3800 litre (1000 US gal) tank. RECYCLING: This product package including the container and shipping carton are all designed to be recy-cled.